As most music educators know, there’s a longstanding debate about whether the ability to perform music at an expert level is due more to talent or practice. A recent article in the NY Times (July 14, 2014) discusses a paper in Psychological Science on whether talent or practice is more important for achieving an elite level of performance. Based on a meta-analysis of 88 studies across several domains (i.e., music, sports, games, etc. ), the paper claims “deliberate practice” explains only about 20-25 percent of the difference between elite and amateur levels of music performance. In other words, says the Psych Science paper, talent is the key. Contrary to the Psych Science paper, however, seminal research by psychologist K. Anders Ericsson (1993) argues that practice explains about 80 percent of the difference between elite performers and committed amateurs. Are both right, or wrong? Do talent and practice account for different percentages? Or is there significantly more to developing performance abilities than these and similar studies claim? 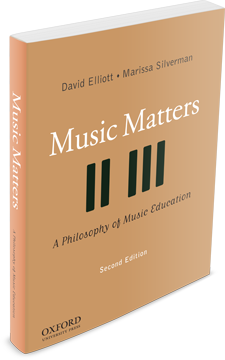 Before offering some perspectives, we must emphasize that because we’re writing this blog from the viewpoint of our praxial philosophy of music and music education, as explained in Music Matters: A Philosophy of Music Education 2nd ed., we are not primarily concerned with developing students’ ability to perform at an elite—“Gotta get to Carnegie Hall!”—level of ability. We’re centrally concerned, as we think public school music education and community music programs should be, with fostering lifelong music making of all kinds; with enabling and empowering students’ musical understanding—musicianship + listenership—toward joyful and meaningful “amateuring” through performing and all other forms of music making, as well as listening. Of course, our philosophical stance and practical guidelines don’t rule out teaching students to develop their performing abilities to the highest levels they wish to attain. But again, this isn’t our primary concern in discussing the nature and role of performance in music education. Now back to the research studies in question. First, it’s important to consider that all domains of research are vulnerable to objections from the outset because researchers’ methods and the central concepts they investigate (e.g., talent, practice, creativity, expressiveness) are inevitably limited by the ways they define the concepts they investigate and the specific training, methods, and assumptions they use in their research. So a serious first question we need to ask about any “talent vs. practice study” is this: How carefully, logically, and comprehensively does researcher X explain what he or she means by talent and practice, or deliberate practice? Which brings us to the next point: Taken together, there’s still no consensus among scholars in psychology, music psychology, music philosophy, and the neuroscience of music about what “musical talent” actually is. And there’s no consensus on what musical aptitude is, or how best to “measure” it, if that’s even possible. For example, it’s easy to determine when someone is playing in tune, with rhythmic accuracy, and so on. It’s quite another thing to “measure” whether a musician is performing expressively, let alone creatively. Surely “elite” performing has a lot to do with a musician’s ability to interpret and perform a score expressively and creatively. But discussions of talent and practice rarely examine these aspects of performance. Third, most examinations of talent vs. practice fail to consider carefully the many kinds of “musical thinking and knowing” that constitute “musical understanding,” viewed holistically. In chapter 6 of MM2 (pp. 206-231), we provide a detailed explanation of our concept of the 16 kinds of musical thinking and knowing (MTKs) that music performers and other music makers acquire (if educated properly) and require to perform competently, proficiently, or expertly. These MTKs range from action skills (techniques, routines, etc.) to verbal and nonverbal experiential and intuitive understandings, to interpretive abilities, and so on, all of which must be absorbed into one’s actions as a performer. Fourth, developing students’ performance abilities most likely includes establishing and/or facilitating many types of music teaching-learning conditions including (but not limited to): continuous experiences of joyful and meaningful practice sessions related to an excellent teacher’s coaching and formative assessments of progress; sustained motivation; repeated opportunities to apply the results of one’s practicing in satisfying “flow” experiences of musicing with others; teaching and performing contexts that build students’ individual perseverance, resilience, and sense of self-worth—qualities that are essential for overcoming personal and professional frustrations and failures; encouragement from significant and supportive others; positive teacher-student bonding; access to inspirational musical models—inspirational musicians/teachers often ignite student’s musical aspirations; opportunities to perform for various audiences in different venues; and teaching that encourages students’ expressive interpretations and performances of scores. Bottom line: It seems fair to say that music educators at all levels should be reasonably skeptical about studies of any musical topic; research is not always as “right” as it may seem. Yes, researchers of all kinds have made HUGE contributions to music education, the development of musical expertise, etc. But many studies are weakened by their methodological inability or failure to take holistic views of the people, topics, and problems they study.